Even though modern cars have a whole lot of technical and electronic novelties on board, a simple indication of the state of the car battery is often absent. With the aid of a small circuit, using a few transistors and LEDs, it is simple to make such a thing yourself. This small, practical tester continually monitors the state of the battery in a car and indicates the battery voltage using a few LEDs. 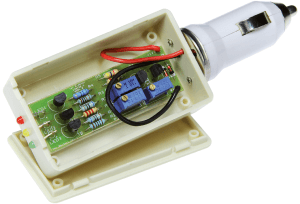 There are only three LEDs present, but that is sufficient to give a good indication, provided that each is set to show an appropriate voltage range.